Here is my recent favorite joke going around on Japanese Twittersphere. to British "gentlemen would do Twitter"
to German "the rule says you are supposed do it"
to Italian "beautiful girls are doing it"
to American "you will be a hero if you do it"
to French "don't do Twitter"
to Japanese "everybody is doing it"
BTW, with Kanji (Chinese characters), we can compress all above contents into 140 characters. Power of kanji charcters! Acting on his mentor’s instructions, he donned the suit and jacket — which before he only wore for funerals and wedding receptions — and changed his hairstyle for a taping of Takeshi’s TV program. When the show aired, his appearance generated an industry buzz. 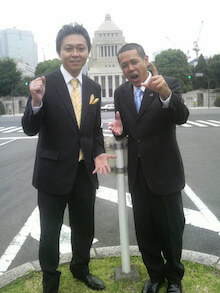 DPJ party leader Hatoyama became the prime minister of Japan officially yesterday. Aside from all politics talks, I am interested in the fact that he studied in Stanford for his PhD in engineering. In other words, he is a sort of Silicon Valley insider. A few weeks ago, when Google's top page logo turned into an "alien abduction" and they put up an encrypted message "all your o's belong to us" on Twitter, in addition to "regular" speculation in English net, a rumor that it is actually a satire for Mrs. Hatoyama went around in Japanese blogosphere. An interview article was published the day before saying that Miyuki Hatoyama, the new first lady, declared that she was abducted by UFO in the past. Mr. Hatoyama himself was nicknamed "space alien" for a long time, so it was a big political joke in Japan. That article was translated into English and was published in various major media overseas. Then the next day, Google UFO logo appeared. So people speculated. According to a podcast TWiT, the logo was supposed to be for an anniversary of a famous computer game, but I was thinking that it may also have been a political satire by a Google insider, who personally knew Mr. & Mrs. Hatoyama. Given his close tie with Stanford, the home of Google founders and many of its employees, it may not be a wild speculation.